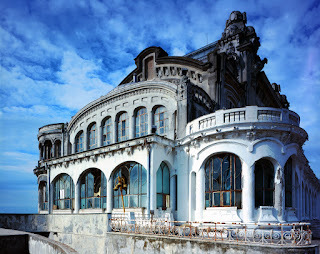 Overlooking the Black Sea, Casino Constanta sits empty awaiting the promise to return it to its former grandeur. Even its current state, a dilapidated sea side relic, tourists flock to the once grand casino. Located on the Port of Constanta in Constanta, Romania, the Casino Constanta overlooks the busy shipping port that sees 55 million units of materials in total traffic per year. The Casino keeps watch over the incoming vessels with its dark, empty windows. The project was commissioned by King Carol I who declared Romania a sovereign nation after the Ottoman Empire was defeated in 1866. During the time of King Carol I rule, the country was heavily influenced by the French, although he was German born royalty. King Carol I, himself, was related to the Bonaparte family. One of his grandmothers was the niece-in-law of Josephine Beauharnais, the wife of Napoleon Bonaparte. The French culture was influenced by Napoleon III of France, who enjoyed close political relations with King Carol I. The Casino was built in the early 1900’s by Romanian architect Petre Antonescu. Petre Antonescu, born in Romania in 1873, was a leading architect and personality in the country. Petre Antonescu was known for building the former administrative building to the Palace of Craiova, the City Hall Bucharest and an Investment Bank in Bucharest. Studying architecture in Paris, the Art Nouveau influence can been seen in every aspect of Casino Constanta’s interior and exterior. Once complete in 1910, the Casino was a symbol for the city. But the golden age of the Casino was short lived. The building itself survived two world wars, however economically the Casino didn’t survive the hardships that the wars brought. The wealthy socialists that came to gamble and enjoy the music and dinning no longer frequent. By World War II the casino had closed. Even in its skeletal, crumbling and faded condition the intricate columns, detailed frescos and the sea shell shaped windows still are impressive. The Casino was so extravagant that it attracted European royalty and celebrities and dubbed “The Monte Carlo” of Romania. The success and the praise for the building spurred a building in Monte Carlo, Monaco to be built in its image. To look at the monochromatic building from the outside you can see the lingering beauty. A faded sign on near the roof line the only remnants that it was once a gathering place to gamble. The building was also used as a temporary hospital during World War II, using its many ballrooms to house patients. 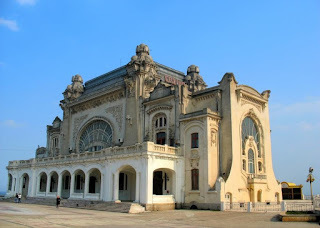 Then when communism regime was in power the Casino Constanta was used as a restaurant. The doors were closed for use in 1990. Many investors over the years have purchased the building to renovate and open, however the costs of the renovations kept mounting, forcing the owner to sell. The size and scope of the renovations for this building are large. 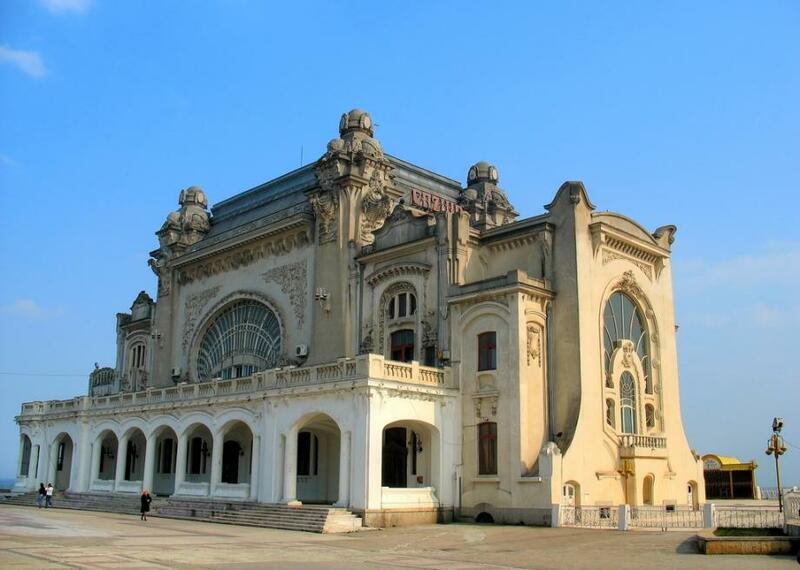 With little done to repair the building over the years, coupled with the brutal weather from the sea, it will be a challenge to restore the Casino Constanta to its original lavishness. The doors are currently closed to the public, this however is not enforced by the municipality. Hundreds of pictures of the delicate chandeliers, the falling plaster ceiling and the peeling paint are found all over the internet. The pictures show the detail of the trim on the walls that frame the hand painted details. There is a rotting wooden stage covered in fallen plaster, located in a ballroom that the walls have faded to a rusty red. The metal scroll work on the grand stair case that welcomes you when you enter and the dirty stain glass windows that are found throughout the building are still in amazing condition, considering their age. As the fall of 2015 draws near, €10 million has been granted to the Constanta Municipality, the current owner of the property, to start restoring the landmark. The restoration will take years to complete. At this time there is no word on yet what the building will become once the renovations are complete. But speculation online that supporters of the site would like to see it turn into a museum. 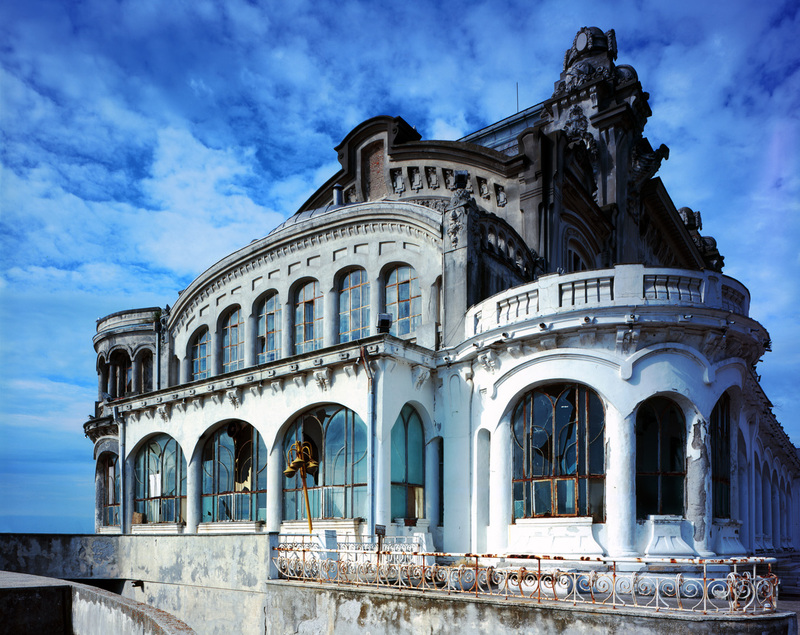 The days for Casino Constanta to spin the roulette wheel have past, however turning this architectural treasure into a space that invites the public into this beautiful building and shares its history with its visitors is long overdue.